Often referred to as “the coolest little capital in the world”, Wellington sits on the southwestern tip of New Zealand’s North Island. For such a small city, Wellington—or Windy Welly as it’s affectionately known—packs a huge reputation. With its fantastic nightlife and renowned entertainment district of Courtenay Place as well as an internationally recognized coffee culture, the city is both cosmopolitan and relaxed. Browse the shops on chic Lambton Quay and then get a lay of the land by taking a ride on the iconic Kelburn cable car. Soaring high above the city, enjoy panoramic views before being dropped off at the doorstep of the Botanic Gardens. Pack a picnic to enjoy when you get there to take part in a favorite local pastime. 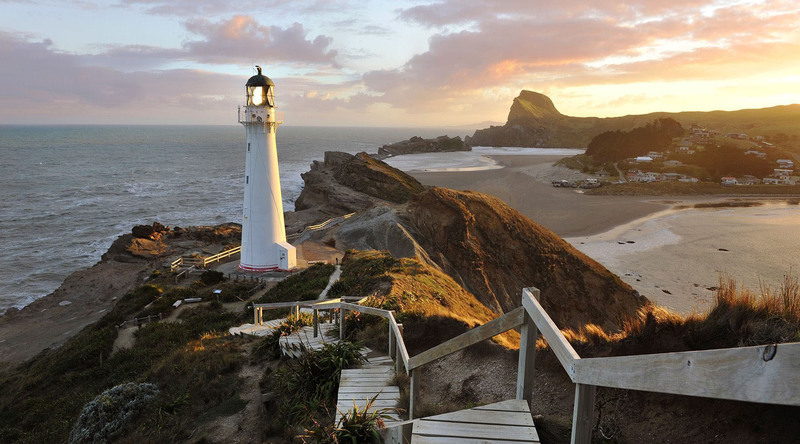 From 19th-century wooden cottages to streamlined art deco structures, Wellington is filled with sculptures, fountains, and art galleries; be sure to visit The Museum of New Zealand Te Papa Tongarewa, the national museum and art gallery. Film buffs will want to tour the famous Oscar-winning Weta Cave—home to props, collectibles, and souvenirs of such movies as Lord of the Rings, Avatar, Man of Steel, and Narnia. Broadly translated to ‘the place of treasures of the land’, this is the national museum and art gallery for New Zealand. The museums features exhibits dedicated to promoting and preserving the rich culture of New Zealand, including the fascinating cultures ad traditions of the Māori people. A popular and familiar landmark, this cable car rises nearly 400 feet above the city of Wellington. Visitors will be treated to spectacular views of the entire city and surrounding area. More than just a popular tourist attraction, many Wellington residents use the cable car as part of their daily commute. Film buffs won’t want to miss visiting the award-winning workshops that brought The Lord of the Rings, King Kong, and The Hobbit to life. A fun and informative ‘Window into the Workshop’ tour allows visitors to peak behind the curtain and see where movie magic happens. Enjoy an immensely personal and privileged look at a wealth of Maori treasures on a behind the scenes tour at the National Museum of New Zealand Te Papa Tongarewa. Join an exclusive group of no more than 10 guests on a culinary stroll to discover the favorite flavors and sumptuous delights of Wellington. Embark on a delectable excursion that features brunch at one of the city's best 'Free Houses', followed by a craft brewery tour and chocolatier visit.